Could we see something very similar to the beloved Scuderia Cameron Glickenhaus SCG 003 show up as an LMP1 contender in the World Endurance Championship? Maybe. 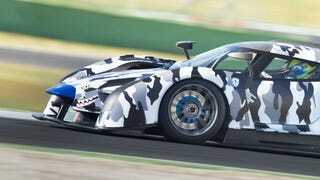 According to autojourno Andrew Frankel, Jim Glickenhaus said that he wants to be at Le Mans by 2017. Currently, this tweet is all I have to go on, but since it would be fantastic to see a privateer compete at the top level of international endurance racing, I'm running with it anyway with the huge caveat of we've only seen this in one place. I assume this was something Glickenhaus told Franke at the Geneva Motor Show, however, I want it to be legit in so many wonderful ways. There were rumors of Glickenhaus going to Le Mans back in 2012, but nothing ever came of it (unless the prototype-like SCG 003 counts). Hopefully this time the rumblings are for real: bring that SCG 003 to Le Mans!